Happy New Month Everyone and welcome to December!!! Woow, just like yesterday the year started and now we are down to the final month ,so let the festivities begin!!!! This post is for all makeup and beauty lovers. 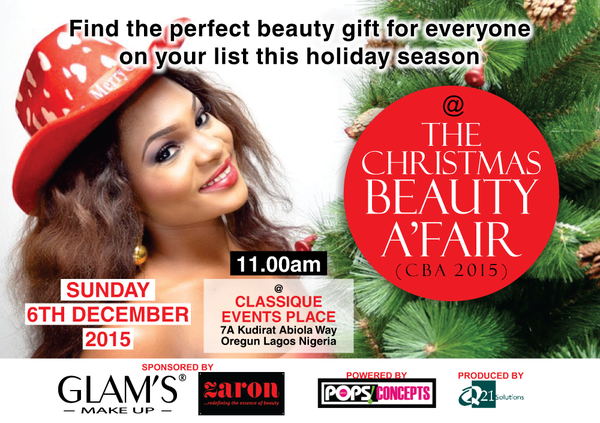 There would be Christmas beauty hampers, goody bags, Christmas gift sets and much more available to be won. Additional features will include beauty product/services exhibitions, freebies/giveaway hour, competitions, complimentary makeovers, food, music, and networking. Exhibition categories include: Makeup product & tools, personal care products, skincare products, wellness& spa luxuries, hair-care, beauty gift packages and accessories. This event promises to be fun and you don't want to miss it. So mark your calendar, and tell your friends to tell their friends. I will to be there. Nice one. **will love to be there. Chai Chloe you don leave us since. Pls update us Na. Compliments of the season y'all. Follow by email,so you don't miss any post. Review: LA Girl Pro Concealer!!! My First Water Fasting Experience. THE ROYAL HAT'S MAN! A PEEK INTO PHILIP TREACY'S FASCINATING COLLECTION OF HATS. GET EXCLUSIVE ACCESS TO BEAUTY BUYS, DISCOUNTS AND EVENTS. © 2017 Dee Ubani. Felicity Template designed by Georgia Lou Studios. All rights reserved.